Beautiful old stone house which has a history dating back hundreds of years. Holiday accommodation for up to 6 people. We have two self catering cottage style gites available to rent in beautiful stone buildings with panoramic views. Both are accessed from an interior courtyard, each having its own entrance and private balcony overlooking the village and hills beyond. The large gite accommodates 4 people comprising one double bedroom, one twin bedroom, a spacious shower room and a kitchen/dining/living room. There is a large private balcony with table and chairs for eating outdoors which has a splendid view across the valley and the village of St. Paul le Jeune. Photos of the large gîte. For a larger group of family, or friends wishing to be together, we also have a smaller gite for 2 people. This has a double bedroom, kitchen/living room, a large shower room and a private balcony with views across the village. 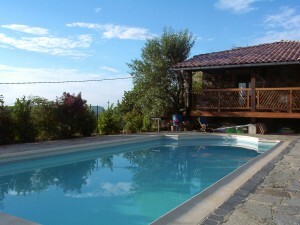 The two gites can be booked together for a maximum of 6 people. 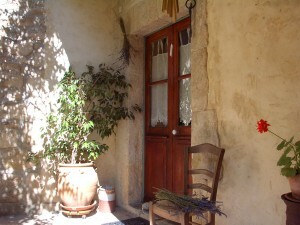 The small gite can be booked separately at certain times of the year. Please contact us for more information. Each gite is well equipped, has WiFi, books and games. (baby cot + high chair available if needed) and a portable bbq. The swimming pool is situated on a lower terrace of the garden and is a salt water pool, 9m x 4.5m & 1.5m deep with steps at one end. There is plenty of space for lounging around the pool plus a shaded area and decking. *Please note that your children remain your own responsibility. We have our own private parking area. Both gîtes are fully equipped for self catering, bed & kitchen linen, towels and bath mat are provided, but not swimming towels. These can be hired for a small weekly charge. Fresh linen provided on Saturdays if you are staying for longer than one week. Available: child’s highchair and cot, laundry service. Washing left with me will be washed and returned, usually within the same day, weather permitting. Cleaning at the end of you stay is included in the rental price. NB – Unfortunately we do not allow pets. Private balconies, swimming pool, 9m x 4.5m – 1.5m deep terrassed garden, forested garden, parking, potable bar-b-que, a child’s swing, loungers and deck chairs around the pool and a fridge on the decking to keep drinks cool, but please no glass around the pool. Colin’s studio is situated on a lower terrace of the garden. 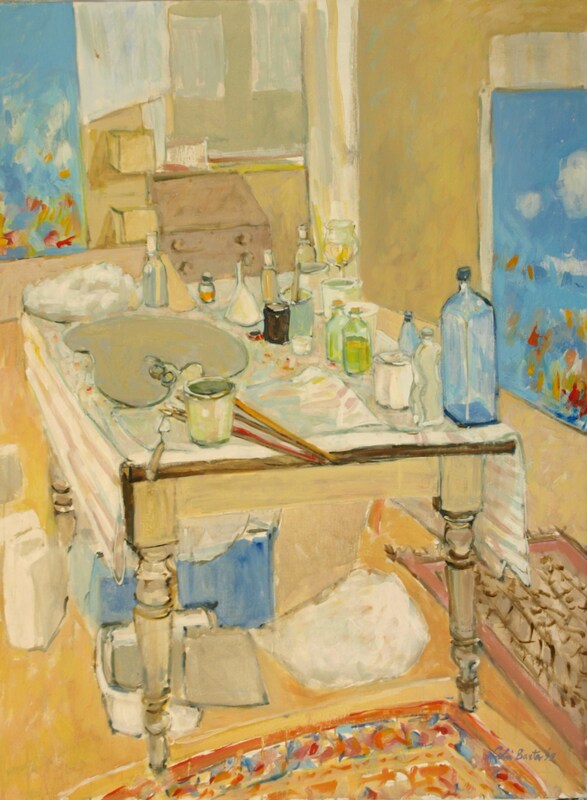 You are welcome to look around his studio and view his paintings. 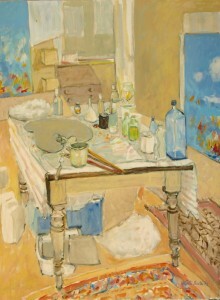 There are also examples of his work in the gîtes which are for sale. Les Monedes is a beautiful place to spend some time. We stayed in the larger gite with our two boys and would love to go back. 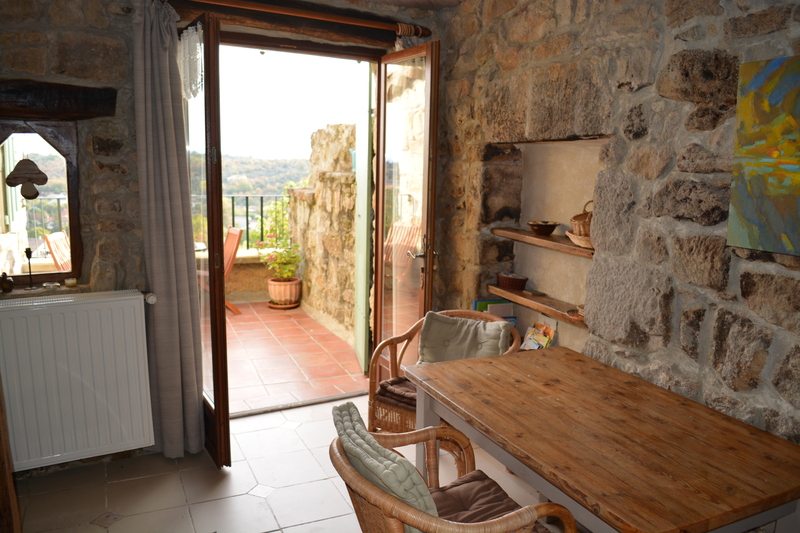 The apartment has a large terrace for dining with a lovely view across the valley. Beds comfortable and kitchen very well equipped. A short walk through a lovely garden takes you to a secluded and good size pool. Jill and Colin are fantastic hosts, staying out of the way so you feel the place is yours but there to help you with anything you might need. The area is between the Cevennes and the Ardeche gorge with plenty of places to explore, river swimming, canoeing and great walks. Thoroughly recommended. This a beautifully restored gite, equipped with everything you need for a restoring holiday. Well equipped kitchen , comfortable beds, tastefully decorated, a terrace for outside dining with a view across the town and a secluded pool. Colin and Jill were the perfect hosts, welcoming and informative about the locality. If you like walking, climbing and swimming in rivers you’ll find plenty to do in the locality. This was our fourth visit in over twenty years. It has been some time since our last stay, but when we arrived, the quiet and peaceful ambience brought back many happy memories of our previous visits. As Jill and Colin are on site, their helpful advice and experience is readily available to smooth the transition from work to holiday. Whether your interests are just lazing by the pool, exploring historic sites or more energetic pastimes on foot or cycle, there is plenty to see and do in the locale. Many of our friends and relatives have stayed here over the years and the fact that we keep coming back is testament to the quality of the accommodation and the friendliness of the owners. 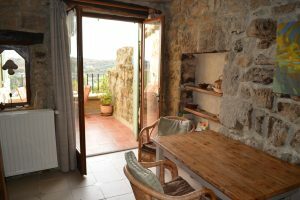 The apartment was furnished to a very high standard and very well equipped.It is private in a lovely courtyard setting with its own balcony with views over the valley. Jill and Colin were extremely hospitable and helpful without being intrusive. The pool is large and secluded. A lot of extras were available including, poolside fridge, communal freezer,ice blocks and picnic cool box use of a beautiful garden. It is close to the town where there are restaurants and bars. We would definitely go back. cosy, comfortable and clean. peaceful setting but only a short walk away from the village. Colin and Gill were friendly and helpful and always there to help, but never invasive. We have stayed in the large appartment twice (in 2007 and 2010) and the small appartment once (in 2009). This gite is probably the best one we have stayed in in France. The area is stunningly beautiful and there are not many tourists locally. We have invariably found the holiday relaxing and the gites are good for adults and children of all ages. It is my teenage daughters’ favourite villa (the wifi helps here but they also love the pool) as well as the adults too! The main benefits are the facilities and stunning views but also Jill and Colin. I am always somewhat reticent about staying in a villa where the owners live on site as overattentiveness can prevent a relaxing holiday. It is a fine balance between that and not being available when there are questions. Jill and Colin strike that fine balance perfectly and they are one of the main reasons that this is the only gite we regularly return to in France. 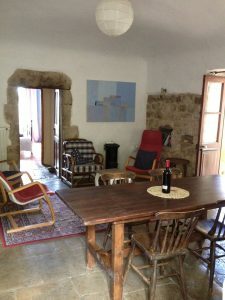 My partner has added: The apartment is very comfortable, clean and well equipped with plenty of space for everyone. We enjoyed many meals (and drinks!) on the large terrace from which there is a fabulous view of the village and hills. We also enjoyed many hours in and beside the lovely pool and felt very ‘at home’. Jill and Colin are extremely welcoming and helpful and we have recommended the apartments to friends. The location is great with a number of restaurants, bars and shops nearby. Secluded, comfortable, great price, excellent. The accommodation was absolutely fantastic and better than described, it is very comfortable, clean, all appliances are up to date; it is quiet, light, well appointed and maintained; a joy to experience. Jill and Colin are wonderful hosts, they are there if you need them and if you don’t then they will leave you alone. We would defy you not to want to make friends with them though, they are very hospitable and friendly and keen to know all about their visitors. The area is very picturesque and there are very many lovely walks, especially if you can find it, down to the “viaduct”. There are various excellent restaurants in the area, particularly La Table des Oliviers, which was superb!! We would recommend this gite (not really an appropriate description) to anyone without any reservation at all, you are absolutely bound to enjoy it as we did. What a great place! We have just returned for the 2nd time and once again we have had a wonderful and relaxing time. The apartment is very well equipped with everything you need for a comfortable holiday. We ate most of our meals on the balcony, which has great views overlooking the village. We all enjoyed the pool and our children enjoyed making dens in the forest directly behind the property. Jill and Colin are great hosts and very helpful with information about the area. There is a lot to do for both children and adults alike – kayaking and river swimming being our favourites. There are some good places to eat and visit nearby. All in all, a perfect place to unwind and relax. We spent 2 fantastic weeks in Les Monendes. We stayed in both Apartments and loved them both, they were decorated in a taste that matched our dreams of Southern France. Both Jill and Colin were friendly and made us feel at home.The kids had hours of fun in the pool and the surrounding area was beautiful with plenty to see and do. A real wrench to leave! The best family holiday we’ve had so far! I have visited the accommodation and stayed in the large apartment on six occasions at different times of the year with a Mediterranean climate throughout the summer. It is a place that fails to disappoint, it is peaceful and quiet whilst affording activities in close proximity should you wish and lovely views of the village if you don’t. If all you want is to relax and switch off the apartment offers comfortable surroundings with a pool to laze by and an artist’s studio to wander around. It is a haven for people with busy stressful lives, a place to switch off and relax in the comfort of what feels like your own home. The environment gives a flavour of rural France with superb markets to try and taste local produce with a large French farmhouse kitchen to practice your culinary skills. The village itself has most facilities with quick easy drives, through superb scenery to local towns. The owners are attentive and interesting but never intrusive and keep the apartments exceptionally clean and well appointed. Ideal accommodation in a beautiful, unspoilt, fascinating part of France. We originally came to stay in Les Monedes ten years ago and have been coming back ever since because we love the place and the area so much and Colin and Jill, the owners, are extremely helpful and welcoming. Our children have loved coming here just as much as we have. The flat is immaculate, with a wonderful view from the terrace. There is everything you could possibly want but if by chance there is anything missing the owners are always happy to oblige if they can. The addition of the swimming pool in recent years is an added bonus, although it is still great to go down to the many rivers in the area to swim. Its our ideal place to wind down after hectic jobs and yet there is plenty to do too. Lots of places to visit, walking and cycling for the more energetic, or just strolling down to the village in the morning to buy the croissants and have a cup of coffee. You do need a car to be able to go further afield. I would recommend Les Monedes without hesitation and the only drawback I can think of is that the holidays there are always too short!